A cycling adventure in the Caucasus - a beautiful land steeped in history that straddles two continents. Travelling by bus and bike, we explore ancient Silk Road cave towns, castles and the wine producing region of Kakheti to visit local farms, vineyards and try the delicious cuisine. Arrive in Tbilisi and transfer to the hotel. People travelling on the group flight from London are not scheduled to arrive until the very early hours of tomorrow morning. After a leisurely breakfast we head out on foot to explore Georgia's cosmopolitan capital city. We start our visit in the old quarter at the Church of Metekhi, before continuing through narrow lanes past cafes and restaurants to the Synagogue, Sioni Cathedral and Anchiskhati Church. We continue, now in the newer part of town, on to the fascinating Georgian National Museum of History, before taking a stroll along Rustaveli Avenue, where we can admire the architecture of many grand buildings that line Tbilisi's main street. This afternoon we take the cable car to Narikala Fortress overlooking the city, from there we walk down to the brick-domed Sulphur baths. Leaving the capital this morning, we drive for about an hour to Mtskheta, the spiritual capital of Georgia. Here we visit Svetitskhoveli Cathedral, founded on the site chosen by St. Nino as the place for the first church in Georgia. Before we start our first cycle ride there will be some time for fitting to ensure all are happy with our bikes and to make any minor adjustments. Our cycle route follows the Mtkvari river and the valley opens up the more we ride. There is passing traffic near the villages and towns we pass through, especially for the first part of the route and the traffic thins out in the second half of the ride. We plan to stop along the way for a picnic lunch before we reach our destination in the cave town of Uplistsikhe. Here an entire town of streets, churches, palaces and residential buildings has been carved into the mountainside. Dating from the first millennium BC, it gradually grew to be an important city on the Silk Road trade route. After exploring what remains of this unusual place we drive on for about 2.5 hours, stopping briefly in Gori to see where Stalin was born, to Akhaltsikhe where we stay in family run guesthouses. Georgian cuisine is famously good with influences from Asia, Europe and the Middle East. There are a variety of vegetarian dishes but many dishes are meat based. Food and wine are central to Georgian culture and feasts can last for hours where the role of the toastmaster is important. Our total cycling distance today is approximately 61 kilometres (total 640 metres accumulated ascent and 520 metres descent). After yesterday's warm up ride we tackle a few more hills and ride slightly further on today's cycle through beautiful landscape to one of Georgia's most significant sites, the cave town of Vardzia. Our route follows the Mtkvari River upstream for the entire day. The first 48km of today's ride, until we reach Khertvisi fort, is along the road that leads to Turkey and Armenia and there are some trucks and articulated lorries in the passing traffic. The start of the ride has gentle ascents and descents until after the dam when these become more pronounced. We will stop to view Khertvisi fort from the outside before carrying on the final 17km on a quieter, undulating road with some steeper and longer ascents to finally reach Vardzia. We will check into our family run guesthouse and have a very late lunch on arrival before exploring this remarkable site later in the afternoon. Bigger and more dramatic than Uplistsikhe, Vardzia was cut into a cliff face by King Giorgi III in the 12th century as a stronghold against the Turkish Sultanate (the Turkish border is only 10km away). Vardzia was subsequently developed by his daughter Queen Tamar, who created a cave monastery that became a centre of Georgian culture. This network of caves once numbered 3000, with up to 19 tiers in some places. Much of it was destroyed after a huge earthquake in 1456 and only about 600 chambers survive. There are numerous churches, meeting halls, refectories and wine cellars, all interconnected by tunnels and stairways. Our total cycling distance today is approximately 65 kilometres (total 870 metres accumulated ascent and 560 metres descent). This morning after breakfast we retrace our tracks and enjoy a scenic ride back down the valley to Khertvisi Fortress. From here we re-join the same road from yesterday that leads to the border and we start the gently-graded, 30km long ascent to Akhalkalaki where we spend the night. The ascent follows the Paravani River, with some short steep sections and the final few kilometres have potholes. Much of the area we visited today and yesterday lies close to the border with Turkey and was a controlled military zone in soviet times. Nowadays the Soviet military base is closed and this small town is largely populated by ethnic Armenians, as it once belonged to neighbouring Armenia. Akhalkalaki sits on the edge of the Javakheti Plateau, a volcanic plateau over 2000 metres in altitude with large grassy plains and lakes. In the afternoon there is the option to learn how khinkhali (dumplings) are made - a popular Georgian dish. Our total cycling distance today is approximately 46 kilometres (total 830 metres accumulated ascent and 380 metres descent). We start the day with a drive of about 1.5 hours to Lake Paravani where we get on the bikes. Georgia's largest lake is located on the treeless plains of the Javakheti Plateau, known locally for their harsh winters where temperatures can reach 30 degrees below zero. In summer this area of lakes and nature attracts many birds and you can see crane nests in the villages. Our first 5km are spent riding across this impressive landscape before a sweeping descent on smooth tarmac leads us towards Tsalka, and the route flattens out with small ups and downs and some sections of road with potholes and broken tarmac. After a break to visit the small local market in Tsalka our route ascends out of town and we plan to stop for a picnic lunch with views. The roads are quieter in the morning for the first 30km and then become a bit busier after Tsalka. There is a short and steep descent after lunch, into more forested hills, then flat before a long descent to the end point of the ride. Although we climb a few hills the general tendency today is downhill. At the end of the ride we drive for about 1.5 hours back to Tbilisi. Our total cycling distance today is approximately 74 kilometres (total 520 metres accumulated ascent and 1700 metres descent). Travelling east from the capital this morning we drive for about 1.5 hours through forested countryside into the central mountains. Back on our bikes we start our ascent of the Gombori Pass, the most challenging part of the holiday. The first few kilometres are gentling ascending through the trees and the final 10 km of the ascent is steep with some very pronounced sections. It isn't a race and the support vehicle is available today (and every day) in case anybody wants to opt out of the uphill. There will be passing traffic throughout the ride today. Our efforts are rewarded with fine views from the Gombori Pass (1620m) and there is a short trail leading to a viewpoint above the café. We plan to have our picnic lunch here before starting a long descent through the woodland into Kakheti, Georgia's wine region, with the Caucuses looming beautifully ahead of us. 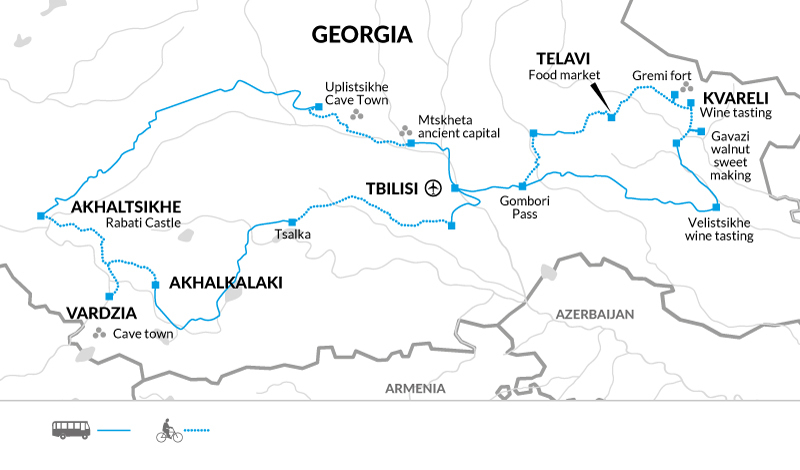 We drive the steep final 3km (optional cycle) to our guesthouse overlooking Telavi, a small town in the foothills of the Tsiv-Gombori mountain range. Georgia is one of the oldest wine regions in the world, has been producing wine for over 8000 years and the traditions of wine are inseparable from the national identity. We spend the next few days discovering more about Georgian wine. This afternoon we visit a local master craftsman who will show us how Qvevri are made. Large earthenware vessels, Qvevri are buried underground as part of the traditional Georgian wine making method. This traditional method has largely been replaced by modern ways. We will also get the chance to try Chacha (Georgian grappa). Our total cycling distance today is approximately 39 kilometres (total 1020 metres accumulated ascent and 1110 metres descent). After breakfast and before leaving Telavi we visit the local food market where stalls are loaded with local produce. Today's cycle ride starts out of town and leads us on largely straight, flat roads with passing local traffic, past vineyards to the small town of Kvareli. Our first stop is at Gremi Fortress - once the capital of Kakheti province in the 16th and 17th centuries, Gremi served as a trading town on the Silk Road. Our next stop is to visit the old monastery at Nekresi, using a local bus up the steep access road. We plan to have a picnic lunch here before continuing the final section of the ride that ends with a gentle ascent into Kvareli. In grape harvest season (early Sept to early Oct) we may have the chance to have a go. Later this afternoon we can relax and enjoy a wine tasting visit in Kvareli. Our total cycling distance today is approximately 45 kilometres (total 280 metres accumulated ascent and 600 metres descent). We commence our final cycle ride today, on a relatively short ride to Velistsikhe village, on relatively flat and straight roads with passing local traffic. Our first stop is around the halfway point in Gavazi village where we visit a farmer's house to see how traditional Churchkhela Georgian sweets are made and the chance to try a Georgian favourite Mtsvadi (Shashlik) - meat barbequed on a fire of vine branches. Our final cycle ride ends in Velistsikhe with a visit to a local winery where they have been making wine for over 300 years. A short drive takes us to the 18th century town of Sighnaghi, perched on a ridge overlooking countless vineyards below. After a wander around town we enjoy our final family hosted lunch with a view. Finally we drive for around 2 hours back to Tbilisi for our final night in the capital. Our total cycling distance today is approximately 31 kilometres (total 150 metres accumulated ascent and 180 metres descent). When cycling: quick drying cycle tops, padded cycle shorts, lightweight wind and water proof jacket and warmer breathable layers where local conditions require. Weather is changeable in the north and mountains; it can be cool especially at night, bring a warmer jacket. Raingear is essential at all times .A sarong can be useful for covering up your legs when off the bike and visiting religious places. A headscarf is essential for visiting churches and mosques. The Guesthouses have fewer amenities and the en-suite rooms have a simpler character than the hotels we stay at on this trip. 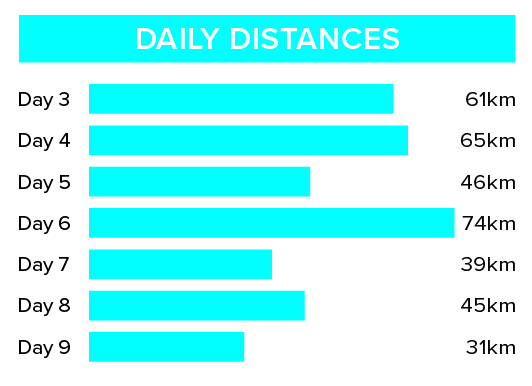 On this tour we cycle 361 km over seven days (an average of 52 km a day). The terrain is a mixture of flat and undulating with some longer and sometimes steep ascents, most pronounced on days 5 and 7. We ride mainly on tarmac and road conditions are generally good with pot holes on some sections. Most routes have passing traffic, becoming busier around urban areas. A support vehicle accompanies the rides throughout the tour. We have graded the route as moderate. Your included bike is a 21-24 gear Mountain Bike with front suspension and will be the correct frame size for your height. You are welcome to fit your own pedals and saddle if you wish to bring them. A support vehicle accompanies the rides throughout the tour. We provide spare parts and take care of the day to day maintenance. All you need to bring is your own helmet.